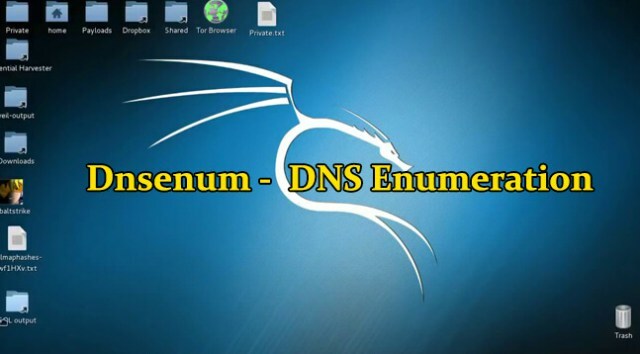 Dnsenum is a tool for DNS enumeration, which is the process of locating all DNS servers and DNS entries for an organization. DNS enumeration will allow us to gather critical information about the organization such as usernames, computer names, IP addresses, and so on. --dnsserver     <server> Use this DNS server for A, NS and MX queries. --enum          Shortcut option equivalent to --threads 5 -s 15 -w.
-h, --help      Print this help message. --noreverse          Skip the reverse lookup operations. --private       Show and save private ips at the end of the file domain_ips.txt. --subfile <file>     Write all valid subdomains to this file. --threads <value>    The number of threads that will perform different queries. -v, --verbose        Be verbose: show all the progress and all the error messages. -p, --pages <value>  The number of google search pages to process when scraping names, the default is 5 pages, the -s switch must be specified. -s, --scrap <value>  The maximum number of subdomains that will be scraped from Google (default 15). -f, --file <file>    Read subdomains from this file to perform brute force. -u, --update    <a|g|r|z> Update the file specified with the -f switch with valid subdomains. a (all)    Update using all results. g          Update using only google scraping results. r          Update using only reverse lookup results. z          Update using only zonetransfer results. -d, --delay <value>  The maximum value of seconds to wait between whois queries, the value is defined randomly, default: 3s. -w, --whois          Perform the whois queries on c class network ranges. -e, --exclude   <regexp> Exclude PTR records that match the regexp expression from reverse lookup results, useful on invalid hostnames. When you run this command, it with perform brute force search on subdomains along with the custom file passed as an attribute.